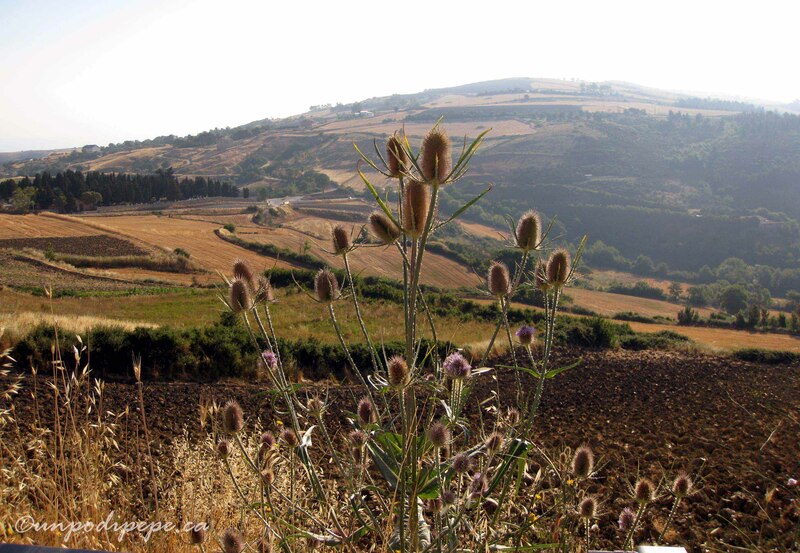 When I am in Orsara di Puglia, I go for a long passeggiata (walk) up the mountain almost every morning. When you spend weeks eating lots of yummy food, this is necessary. Orsara is already at 650-700 m elevation (2300 ft) and my walk is uphill a lot of the way so there is some good altitude there. I leave Orsara via Via Castagneto and take the Via Nuova, go past the Cimitero (cemetary) and then take the uphill zigzags to ‘La Montagna Spaccata’. At one time this was a steep windy dirt road, but now it is paved. I like to call it ‘la palestra di Madre Natura’ or ‘Mother Nature’s gym’. 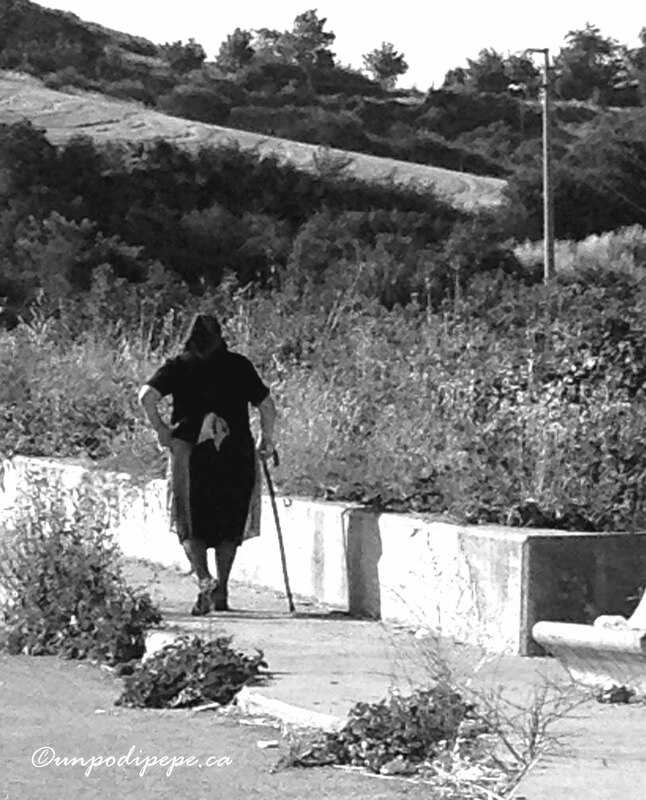 In the early to mid morning and early evening many Orsaresi of all ages are out walking. ‘Spaccata’ means cracked or split, as in split into 2. The reason for the name is that part of the mountain is in Puglia and part in Campania. In fact, Montaguto, the closest village to Orsara, is in Campania, in the province of Avellino. Arriving at the ‘frontiera’ (border), you can see the difference in the asphalt where one regione has stopped paving and the other has started. 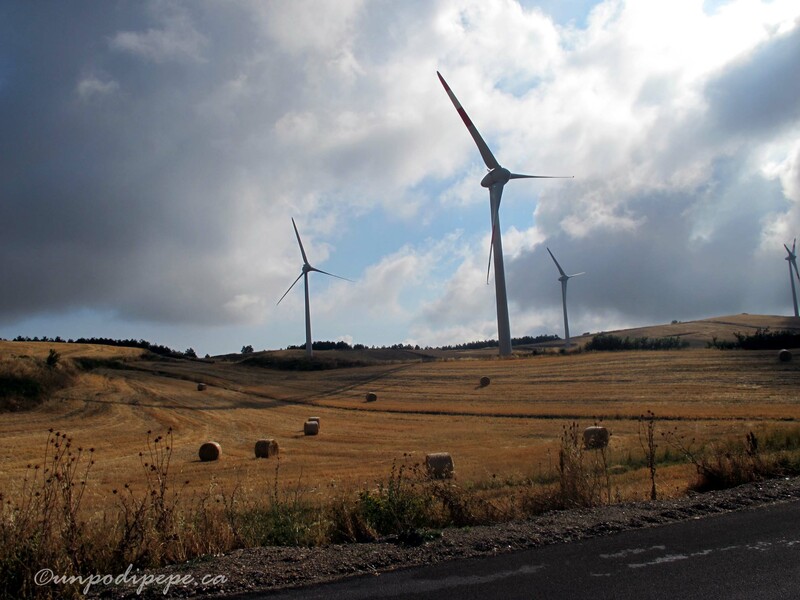 Just beyond the border is the Parco Eolico di Montaguto (wind farm) and the road also flattens out a lot. I usually walk to this ‘frontiera’ and then walk back down. Sometimes I go father, and a few times I have even walked all the way to Montaguto which is 6 km away. I always thought Montagna Spaccata was just a ‘local’ name and that it had a real name. I tried to find out, but no one seemed to know for sure. I did some heavy duty research, consulting wikipedia….oops, I mean my amico Donato, who asked his amico Leonardo who consulted the official IGMI (Istituto Geografico Militare Italiano) military map …..and what do you know, Montagna Spaccata is the actual name! I love my morning passeggiata. I can breathe in fresh aria di montagna (mountain air) and get some exercise-aka an excuse to eat more! 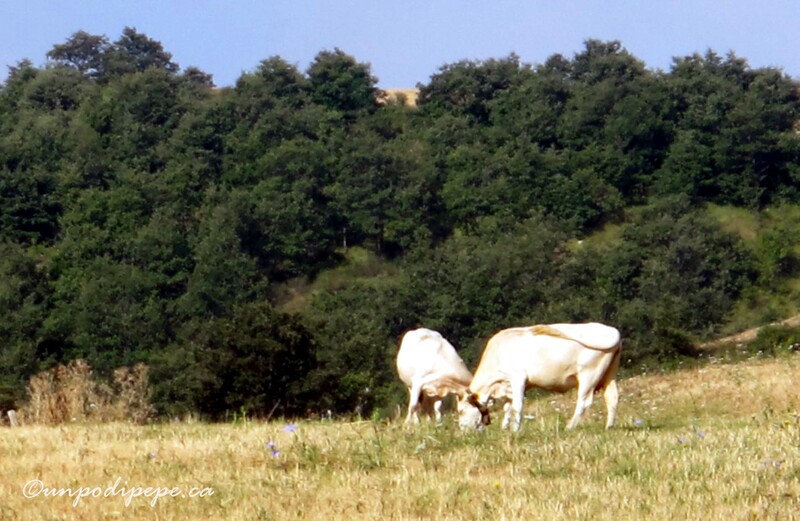 I also enjoy and photograph some breathtaking scenery and views of Orsara di Puglia and even meet friends along the way. See for yourself…..
Much nicer Lyn, although the getting up early part is hard. There is no shade and it gets too hot if you sleep in! 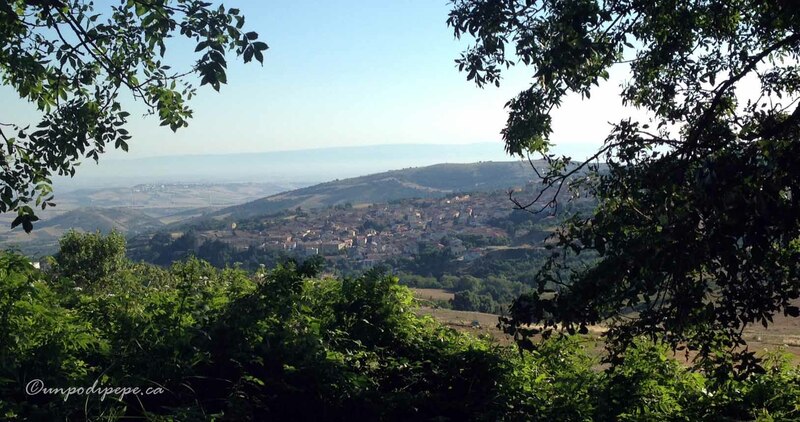 I love your passeggiata….I can’t imagine anything as inspiring to see along the way. Your photo of the elderly lady out walking is just how I imagine the elderly people to be…walkers! They are always out gardening, and going ‘foro’-which refers to walking to their piece of land to tend the garden. That’s what keeps them young. Glad you liked the images. I had so many to choose from it was difficult to pick! 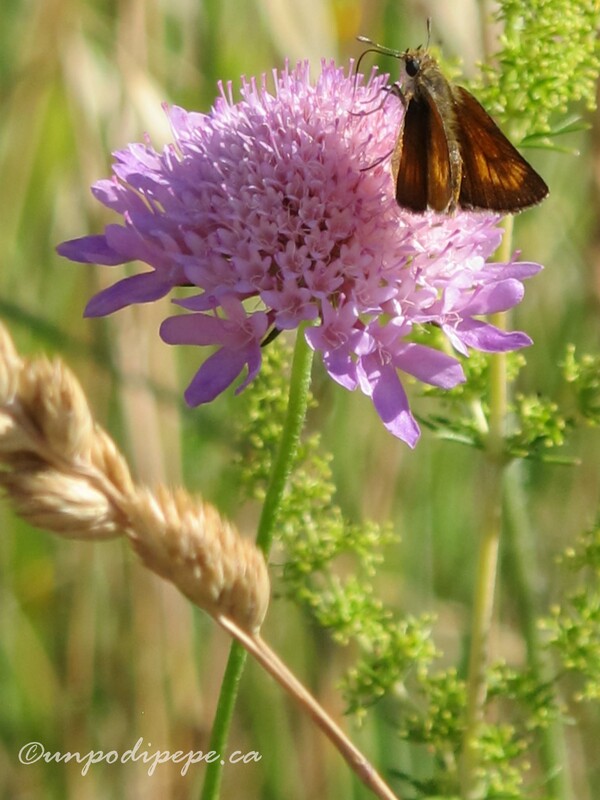 Longing for a morning passeggiata myself… Love your butterfly photo. Gorgeous! Grazie Signora Martini! 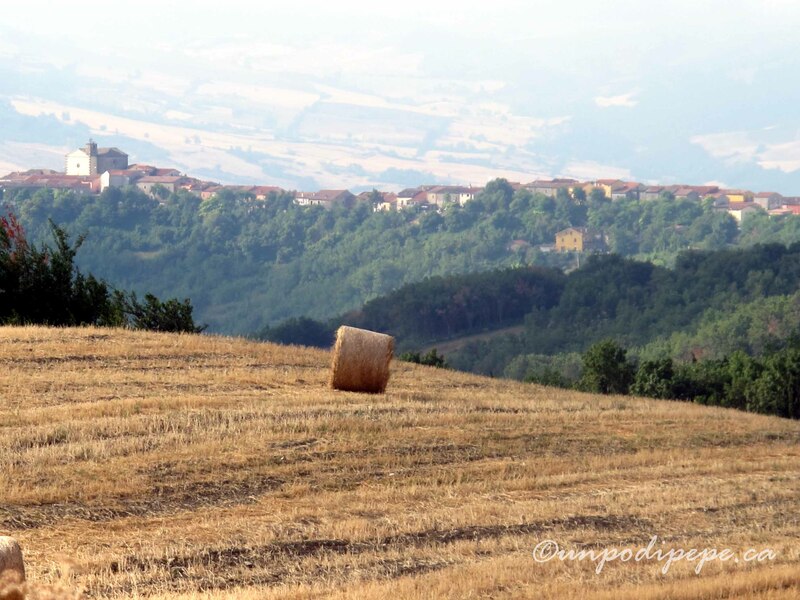 There is always something new to see on the morning passeggiata. 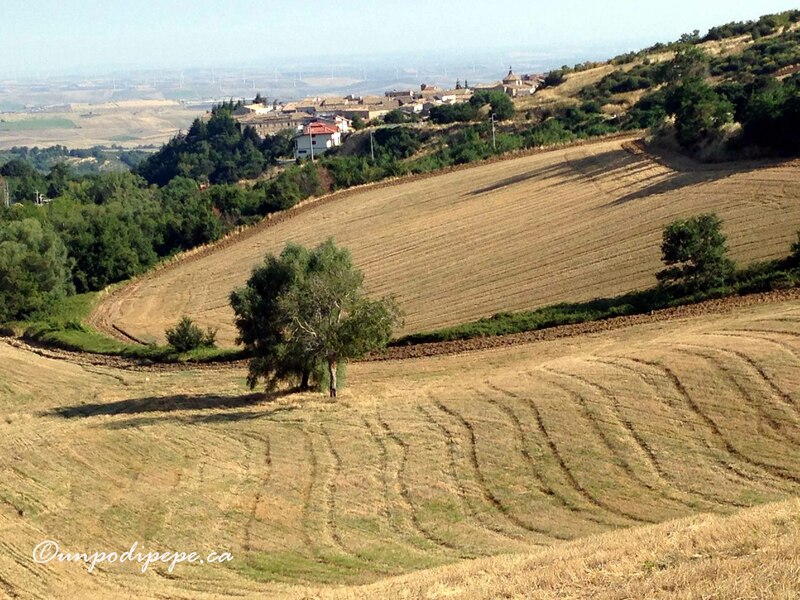 I love your posts on Orsara di Puglia as well as the beautiful photos. My grandmother was born there and came to the US in the early 1900s. Thank you for the chance to see my ancestral town. Looks like a real paradise! Grazie Susanne! Maybe one day you can come too? The pictures are small so shouldn’t have trouble loading-maybe just refresh the page? Grazie Ishita. It was hard to pick the photos because I have so many!